We love Dell’s rack servers. We integrate hundreds each year, calibrating each one to the customers’ individual needs. Your company’s server is the hub of information, and really the most important piece of hardware in the building. But how can you ensure that the information on that all-important server is safe and secure from day to day? 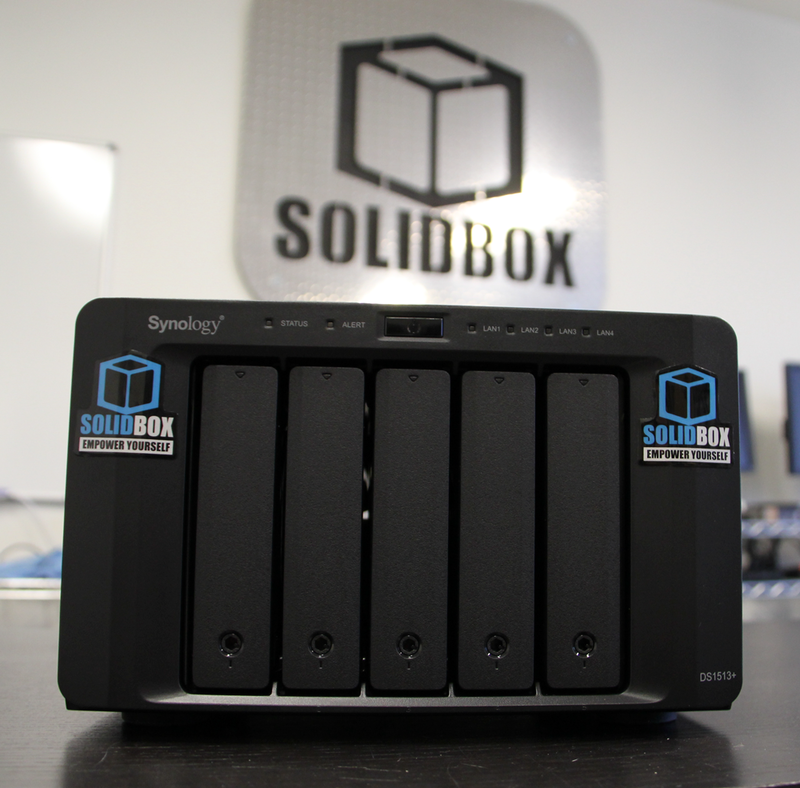 Scalable NAS from SolidBox, that’s how! After extensive investigation and testing, we now offer a simple and elegant solution that will put even the most paranoid IT technicians at ease: The SolidBox Scalable NAS. The SolidBox Scalable NAS (Network Attached Storage) is Synology’s ultra-stable storage device capable of backing up your current rack server, or replacing a server altogether. And it truly becomes a SolidBox NAS once we implement the same integration that our servers receive. The SolidBox Scalable NAS provides flexible scalability by offering many different storage and RAID configurations. Our standard configurations are the two most commonly requested, although we are able to accommodate any requested configuration.our servers products receive. SolidBox NAS 1 DS412+ has four bays that each hold a 1TB 7200 RPM SATA III HD in the cutting edge SHR (Synology Hybrid RAID) array yields three TB of storage, and allocates one TB for backup protection. SolidBox NAS 2 DS1513+ with five bays that each hold a 2TB 7200 RPM SATA III HD in the SHR array yields eight TB of Storage, with two TB allocated for backup protection. Just so we’re clear, that’s 8 TB, or 8,000 GB, or 8,000,000 MB of storage in the most secure RAID array available. If you’re looking for secure data, this is your device. One or both of these standard configurations should work for your business, but if you’re not convinced that the SolidBox NAS 1 or 2 has what it takes, we encourage you explore the Synology’s RAID Calculator to find the right configuration for your data storage needs. However, cost will have to be discussed to determine the difference in price from either standard configuration. The SolidBox NAS is robust enough to take the place of a rack server for many small and medium businesses. However, if a server is already in place, the SolidBox NAS provides the absolute best protection for your business data.